In the early 1990s, after years of working as a physical therapist, Karen Washington noticed that many of her patients were steadily gaining weight and struggling with diabetes. She realized the people seeking treatment shared something else in common—a lack of fresh produce in their diets. The connection hit home when Washington saw her own son experience the same ailments she heard from her patients. The lifelong New Yorker and dedicated mother vowed to do better for her family and her community. In the years since, the list of accomplishments Washington has racked up is enough to make any foodie or activist jealous. Former president of the New York City Community Garden Coalition, Washington has sat on the boards of organizations like Just Food, WhyHunger, and the New York Botanical Garden. She was also named a Woman of Distinction by New York State for her role creating a vibrant urban agriculture scene in NYC. Most recently, the James Beard Foundation awarded Washington its prestigious Leadership Award for her commitment to improving the lives of low-income residents in the Bronx by growing fresh, healthy food close to home. No wonder she’s known to many as the Queen of Urban Growing. But Washington’s success is part of a bigger story, about communities standing together to fight for the respect, dignity, and yes, food, they deserve. When fellow Bronx activist and mother Tanya Fields was disinvited from TEDX Manhattan in 2013, Washington bowed out of the event in solidarity; the two women teamed up for Fields’event Not Just Talk, which aimed to imagine a truly just and inclusive food system. 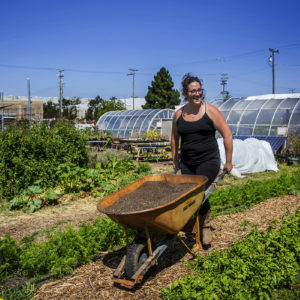 While Washington’s farming chops are enviable, it’s her commitment to her community that has made her gardening career flourish. We spoke with Washington about the ongoing struggle to protect urban lands and the enduring strain racism places on our food system. How did you get started working in the food system? Back in 1985, I had this big backyard and I could do three things: cement it, put in a lawn, or grow food. I decided to grow food, then three years later I started my first community garden. The resurgence and interest in growing food. And the fact that people, especially young people, are finally realizing the importance of eating healthy and the relationship food has to health and exercise. What has been your biggest victory or success working in the food system? What has been your most difficult challenge? A few colleagues and I were asked to participate in an urban agriculture task force for [New York City]. After years of struggling with the city regarding land preservation and community gardens, for them to finally recognize the true value of growing food in cities was paramount for me. 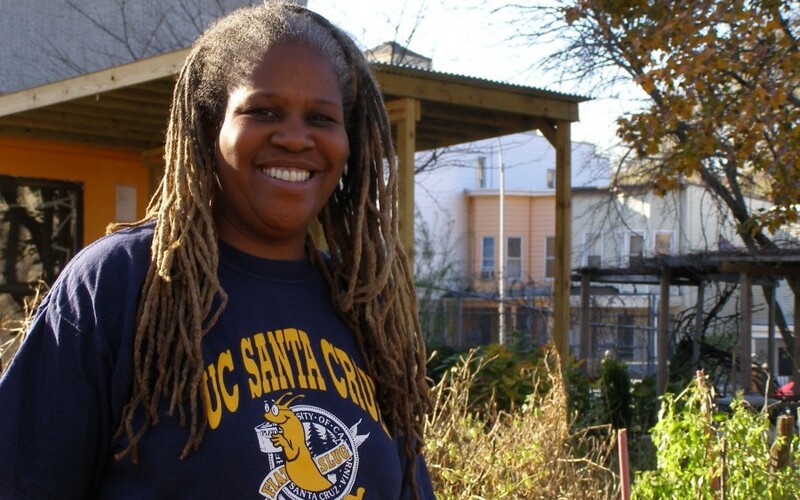 Another [victory] was the formation of Black Urban Growers, which we started to shed the light on discriminatory practices still prevalent in the food system. Also, the start of Farm School NYC. The most difficult challenge is getting New York City to grant permanent land status to community gardens. Land is political. We’ve made really great strides in protecting gardens, but there are still challenges especially when you have developers with deep pockets and influence. 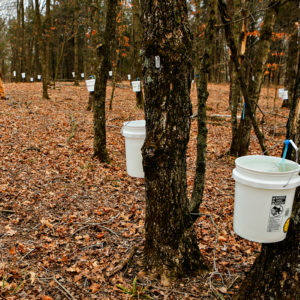 What do you think is some of the most exciting work going on in our food system at large? 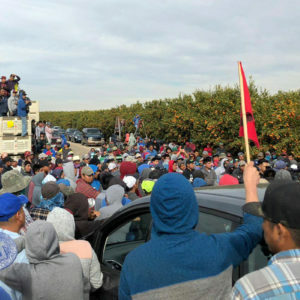 Protests around the country and around the world for better working conditions and better pay for farmers have been paramount. The idea of “food sovereignty”captures the importance of land ownership and growing culturally appropriate food. Groups like La Via Campesina, as well as rural and urban farmers, consumers, and food workers, are all contributing to [the idea of food sovereignty, which is an] integral part of our food system. What do you think is the role of grassroots communities in changing the food system? Policy makers? Businesses? The role of grassroots communities has to be making people accountable. When it comes to policy makers, for too long we have been complacent letting government and lobbyists make decisions around our food. We must be at the table [so that] we’re included, and we can demonstrate our leadership. I want businesses to come into my community that will offer living wage jobs that include promotions and ways people can better themselves. I have proposed to the city that there should be a cap on the number of fast food restaurants in low-income neighborhoods. There should also be more tax breaks and incentives for businesses bringing healthy choices into our communities. When I go to wealthy neighborhoods or [visit] my friends who are white, I don’t see a McDonald’s on every block. I see nice restaurants and fruit stands. Why is that? I’m asking for the urban planners and city officials to sit down and look at the demographics. What is the most important change you would like to see in the food system in the next 5-10 years? More people of color in key positions of leadership and power. I want people to be uncomfortable in a way that makes them look at their surroundings and say, “Who’s missing?” How can you talk about food policy or food systems when there’s one demographic of people making all the decisions? I’m not talking about tokenism. I’m talking about more people of color in leadership positions and as decision makers. A fair, just, and equitable food system needs to have a more mosaic representation of people. What needs to happen for that change to occur? Do you see yourself as part of a food movement? Yes. Don’t I eat food? Food is the common denominator between all of us, and because of that, I’m going to continue to be a grower, a consumer, a leader, a mentor, and an activist. What do you think that movement needs to do, be or have to be more effective? The movement has to be global. What happens in Mexico, Venezuela, and Haiti will eventually affect the people in the Bronx. Are there any foods you love to eat that don’t perfectly align with your politics–your “guilty pleasure” food from a justice or sustainability perspective? I’m a sports addict. My favorite team is the Yankees, so I’ll wait to do all my work and turn off my phone to sit in my bed with a bottle of beer and chips [to watch the game]. What are you currently reading (books and/or blogs)? Five of my closest friends and I have a website called Let’s Get Farming, and I just finished reading Rory Clemenson’s blog for it. A friend recommended Nelson Mandela’s book, A Long Walk to Freedom. This man had to endure so much, and walked away without the anger and hatred directed at him. He was able to put that away somewhere in the face of love and justice. I try to live my life that way, and I think reading Mandela’s book will help me with that. What is one revolutionary food act you have participated in? Food should be a right for all and not a privilege for some. When a person is given dignity when receiving food, it will thwart the shame associated with hunger and poverty. What would you want your last meal on earth to be? My favorite meal is baked chicken with sweet potatoes and fried cabbage. The cabbage has to be seasoned well, with onions in it. I’d also like a couple of croissants to sop up the juices from the chicken and the cabbage. My deep respect for her. People should learn how to grow their veggies at home. It is not that difficult and can be financially interesting for the lower and middle classes. Localization of the food production is one of the best things we can do against the current problems with the climate change. We need people like her to influence city councils to also allow to plant in the public areas, so that food becomes available to everyone. Instead of buying expensive apples from Chile, you could grab one grown locally on your street. She is a fascinating woman who is all so featured in Dr. Daphne Miller's book "Farmacology". What Washington is doing is quite amazing . Karen is a generous and courageous mentor and leader, and is esteemed for her work, dignity, and compassion. She has been a strong voice and advocate for food and economic justice, and an inspirational force for projects such as our women-led farm in The South Bronx. Karen teaches how we can all become leaders in our communities by paying forward the lessons she has benefited from in her life. Thank you, My Sister - Gracias Mi Hermana - for showing us how to get it done!